No, Ed was not a member of the CIA during our tenure in Benghazi. 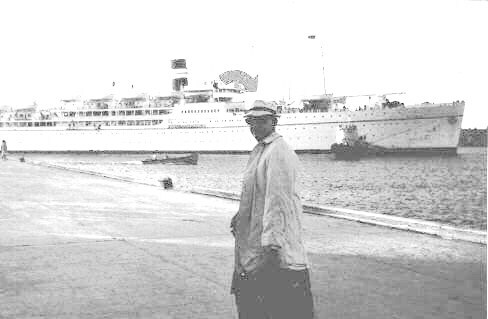 Here he is preparing to board a cruise liner that is actually a school ship, complete with classrooms and educational materials. He had the opportunity of taking all of our secondary students (about 30 of them, various nationalities) on a cruise of the Mediterranean. As the ship made its rounds along the North African, Middle Eastern, and European shoreline, it regularly picked up school groups. Ed and his teachers (for this was the second year, when he was Headmaster) would use the classrooms and materials to teach the students about the next port of call. Then they would tour the area, observing and learning first-hand the culture, history, geography, weather, etc. Back on ship they would journal and write essays about what they had seen and done before getting ready for the next port of call. THE ULTIMATE FIELD TRIP.